Alex Morgan and her Olympique Lyonnais Feminine (“OLF”) teammates take on D1 Feminine (“D1F”) League rival Paris Saint-Germain (“PSG”) in a match held at home at OL’s main stadium, Parc Olympique Lyonnais (“Parc OL”), a 59,186-seat stadium in Décines-Charpieu, a suburb of Lyon, France nicknamed the Grand Stade and the Stade des Lumières on May 13th, 2017 that saw OLF beat PSG 3-0 on goals from strikers Eugénie Le Sommer, Ada Hegerberg and Morgan. The match was of little consequence except for bragging rights as OLF already wrapped up its eleventh consecutive D1F League Championship Title on May 8th, 2017 versus Soyaux in a 9-0 rout. OLF sought a little revenge given their only league loss came at the hands of PSG earlier in 2016 before Morgan joined the squad. Unfortunately, Morgan strained her hamstring in the 40th minute and was subbed off soon thereafter, replaced by fellow striker and French International, Elodie Thomis. OLF are also the defending UEFA Women’s Champions League (“UWCL” or “European Cup” or “Coupe de Europe”) winners, claiming the title in 2016 along with the French Cup (“Coupe de France”) title, as well to complete the Championship Treble (“Triple”). 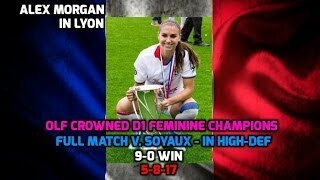 Morgan and the club will next face PSG again in both the French Cup final and the ultimate UWCL final held in Cardiff (the capital of Wales, United Kingdom) on June 1st, 2017 with both of the titles on the line. ©2018 by old fdny trucks. All Right Reserved.